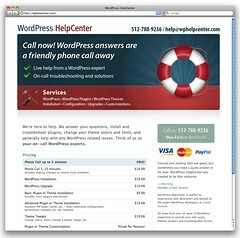 I’m very pleased to announce that WordPress HelpCenter is now open for business. WordPress HelpCenter is a real-time support center for all things WordPress. We can answer simple questions about how to create categories and tags, how to use your links list, or we can help you install and/or troubleshoot themes, plugins, etc. and answer questions about your WordPress.com blog. We can also make little modifications and tweaks to plugins and/or themes (change your colors, fonts, header images, etc.) as desired. Best of all, we have real developers answering the phone when you call – you can get answers, right now! If WordPress HelpCenter can take care of your needs in under 3 minutes, the call is FREE! We’ve set the service pricing low and we’ve created a price list for most commonly requested items. Every item on the standard price list is under $20. My company, Crowd Favorite, is a partner in WordPress HelpCenter. My development team and I are on-call to the WordPress HelpCenter staff to answer tough technical questions as needed and to generally provide support and expertise as the service grows. We’re committed to providing top-notch service and friendly support. I’ve seen a growing need for this service both personally and professionally over my years of involvement with WordPress. I have a number of WordPress plugins that I’ve released, however I do not have time to provide end-user support for them. Though I wish I could, I don’t have time to answer the many simple questions people email me each day. Now I have a place I trust to send these people to get answers. They can get the answers they need without me being a bottleneck. At Crowd Favorite we build complex sites using WordPress as a CMS. We include help pages in the WordPress admin area for the site manager that covers how to use custom features we’ve built and provide training on how to use them. However, it’s not uncommon for our clients to have multiple authors and editors on the site, and they often have a variety of WordPress related questions. As a development shop, Crowd Favorite isn’t set up to handle these types of intermittent tech support questions. Now they can pick up the phone, call WordPress HelpCenter, and get immediate answers. Forums and mailing lists are wonderful. They are a wealth of information and public archives that are great community support. However, they can also feel unfriendly and intimidating to people who are less experienced with them. When I need a quick answer I’d rather pick up a phone and call someone than write up an email or forum post, then wait for someone else to answer it. WordPress HelpCenter doesn’t replace mailing lists and forums, but it provides an option for those would would prefer friendly phone or email support. The WordPress community has a number of great developers and designers that create fantastic plugins and themes. Having spoken with many of them, I feel comfortable saying that they prefer coding and designing to providing support to people who are using those plugins and themes. If you are such a developer or a designer, perhaps sending your users to WordPress HelpCenter will be a good option for you. Most of my work in the WordPress community over the years has been more technically oriented (building plugins, themes, etc.). I’m excited to be launching a service that is less developer oriented and instead is aimed at helping the many people who use WordPress every day. I think this is going to be an invaluable service for the end-user WordPress community. Next time you need a WordPress answer, try calling WordPress HelpCenter: (512) 788-9236. Let me know what your experience is like. I think this is a great idea! – Wonderful for novices to be able to get instant help for pay if they want it. I own a news website which specializes in exposure of public corruption, and have been attacked by the subject of some of my corruption investigations, both through litigation, and more recently, when he threatened both my webhost and their secondary portal host. I had to move off shore, and am having to manage the tech part of the website myself. Today, I went to link a document to support an artivle, which is typical for the articles I post – ALL public Document substantiated. But the WordPress would not accept any documents, even simply one page. Where do I go to find out what the problem is? I got two different messages, 1) that the files exceeded the php limit, and then 2) that WP could not transfer the file. Help! I am a tech-illiterate. Oh this is WONDERFUL! I will be telling all of my friends about this service. I’ve already sent an email requesting assistance. Great Idea! We are currently revamping our site when but will be sure to do a post release on your service! Very interesting and innovative idea Alex. I am sure this will be a hit. Though WordPress is free, it’s hard to hire quality developers to provide development services and answer questions without paying them. I’m sorry you seem to have jumped to the conclusion that we want to subvert any free support options for WordPress. I can assure you that’s not the case. The support was excellent. My call was answered very quickly and my problem was resolved. They were a great help!